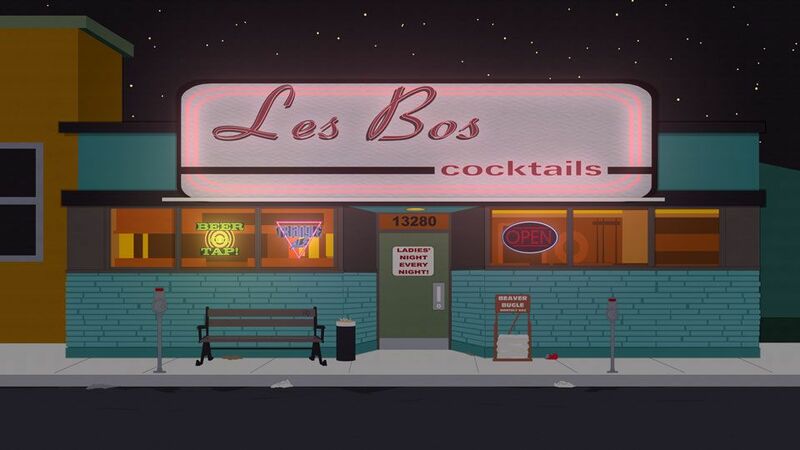 Les Bos (pronounced "Leh boh") is a lesbian Bar and is also known as a "girl bar". It first appears in episode "D-Yikes!" when Allison invited a frustrated Mrs. Garrison to the bar while at the gym. Garrison, being skeptical of the bar, wasn't aware of what "girl bar" meant until she was told when she arrived. Eventually it is revealed that Les Bos was to be bought by Persian club owners but Garrison, feeling like the bar was his new home, vowed to stop the persians at all costs. Garrison eventually managed to convince the persian leader Xerxes to keep it a lesbian bar. The address of the building, 13280, is a numerical representation of the word "lesbo".